Trillium Party Leader, and Newmarket-Aurora Candidate, Bob Yaciuk, was banned from participating in the Elitist Newmarket Chamber of Commerce Candidates’ Breakfast Debate. Despite his numerous attempts to get a chance to be heard by the people in his riding, Bob was not given a legitimate reason for not being allowed to attend, other than “because we said you can’t”. Anyone who knows Bob, knows that he loves his community and he is determined. He attended the Chamber of Commerce on the morning of the May 24th debate and again requested to have a seat at the table with the other candidates. The answer was still a firm “NO”, and Bob was asked to remove his advertising. He did make his way around the room though, as was his right as a member of the public. Bob Yaciuk has lived in the Newmarket-Aurora area for over 35 years. He has lived in the same home with his wife, Cheryl, for 30 years, he shops in Newmarket, he buys his groceries there, he owns his own business there, his doctor is there, he pays taxes there, he is INVESTED in Newmarket and may be the candidate who cares the MOST about his home town that’s running in this Riding. The parachuted candidate, Christine Elliot, was invited to the debate, who has no vested interested in Newmarket at all. How is this democracy? How can there be ANY change if the media continues to favour the same 3 Parties, and not allow people to hear what the others have to say? Trillium Party is the ONLY party that does not, and WILL NEVER have a Party Whip. The Party Whip is a REAL government paid position. He/she has an Office at Queen’s Park, and his/her most important job is to make sure everyone in the party he/she represents votes the same way. If anyone votes differently, they are punished in several different ways. ie, having privileges, rewards, rights taken away. The Trillium Party MPPs are mandidated to vote on behalf of their Constituents. ONLY their constituents. If organizations like the Newmarket Chamber of Commerce feel that they have the right to decide what the business community and the taxpayers are allowed to hear, in order to influence their vote, WHERE IS THE DEMOCRACY? Please help us stop the Manipulation. Let everyone be heard. It’s time for change. Vote for Bob Yaciuk in Newmarket-Aurora, or the Trillium Candidate in your riding! 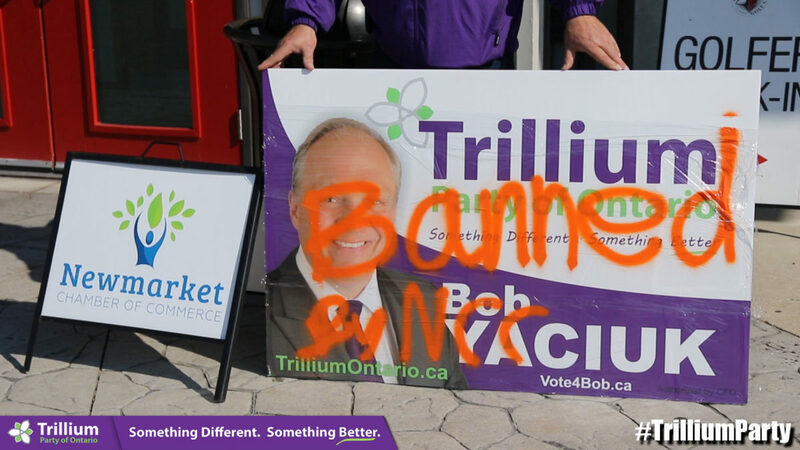 Bob Yaciuk, Leader of the Trillium Party of Ontario, Candidate of Newmarket-Aurora was repeatedly denied admittance to the Newmarket Chamber of Commerce Candidate Debate on May 24th. Bob has lived in the Newmarket-Aurora area for over 35 years.